Pousada Irmao Sol, Irma Lua (Brother Sun Sister Moon). The name of the Pousada is inspired by the Franco Zefirelli film on the life of St. Francis of Assisi. It is Owned and Operated by Martin and Fernanda Mosqueira. This is one of the largest Pousadas in town with more than 50 rooms distributed in several buildings. The large garden and Patio area allow for comfortable dining and restful space for all visitors. Rates are R$160 per person per night. Three meals included. Norberto Kist Pousada One of the newest Pousadas in town. Built to a higher standard for the discriminating guest. Norberto Kist offers spacious well appointed rooms. A tranquil garden setting away from people traffic nice view and meticulous attention to detail to insure your comfort and well being. Pousada Santa Maria - Arthur Rios, casa translator and volunteer for many years, welcomes you to his new venture. 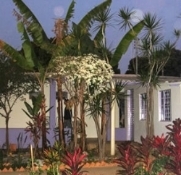 Pousada Santa Maria enjoys nice quiet accomodations in a garden setting a short distance from the Casa. Located between the Hotels Brasil and Amazonas Santa Maria has a nice restaurant (Visitor's Welcome for Lunch and Dinner.) and 23 rooms. 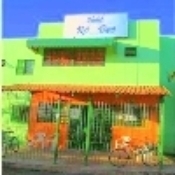 Single rooms are R$120 per day, Double rooms are R$220 per day with three meals included. Free Wi-Fi Internet access Security Cameras - Comfortable and relaxing back yard. Hotel Amazonas is one of the oldest hotels in town . Owned and Operated by Wemerson. It has more than 40 rooms with rates varying from R$85 (single) R$150 (double) and R$225 (Triple Occupancy) R$95 (A/C single) R$180 (A/C double) and R$255 (A/C Triple Occupancy)with three meals a day. It is one block from the casa. Has a swimming pool and a healthy menu. The Hotel Brasil is one of the oldest and most flexible hotels in Abadiania. 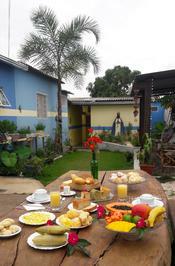 Prices range from 30 to 42 Reais per person per night dWith breakfast included. Accomodatiosn are basic but comfortable. Located 2 clocks from the casa. Reservations are handled by the Hotel Amazonas. Please specify you want hotel Brasil in the comment section of the reservation form. 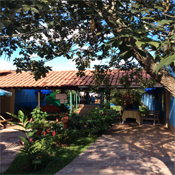 Pousada dos Sunflowers, this to 14 years receiving those who in faith seek treatment at the Casa de Dom Inacio. Now serving in new facilities, featuring 15 rooms, all very nice and airy with ceiling fans, wi fi, a large balcony / terrace on the top floor, so you enjoy the stars in the night Abadiania, or take your bath sun. We are currently serving only breakfast, for soon we will have full-service restaurant with service to the general public. The owners, Claudio, Miriam and his daughter Thais, are volunteers at CASA and able to guide them in the work carried out. Our daily rate is R$ 90.00 (Reais) per person with breakfast. Pousada Santo Expedito (St. Expeditus) Small quiet environment with a garden. (Only 7 rooms) The pousaa is very safe and very clean. Rate is 80 Reais per person. Breakfast is included. All rooms have private baths. Free Wi-Fi. We are only 400 meters from the Casa de Dom Inacio. . You can see pictures on our facebook page. Special monthly rates for long term stays. Pousada Luz Divina Natural beauty abounds 5 minute walk from the Casa's gates. Peaceful vistas filled with animals, nature, golden sunsets, rock waterfall, flowers, labyrinth, and hammocks under mangos...Simply appointed rooms with ceiling fans, cotton linens, and lighted nightstands by comfortable beds. Feel at home with casual dining on veranda and staff willing to help any time. This beautifully decorated boutique pousada is about 1 block from the casa. Rooms are nicely appointed and well maintained. Some rooms with A/C available. Tranquil setting fountain and two garden areas. Rates R$100 per person per night with 3 meals a day. (group rates are 85R$). We accept Visa and Mastercard. 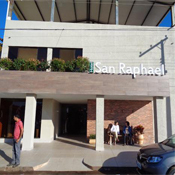 Hotel San Raphael: Recently renovated and perfectly located just a 30 second walk from the Casa. We offer 105 spacious rooms, a healthy and well balanced menu prepared with the freshest ingredients, outstanding service and extremely high standards of cleanliness, daily chambermaid service, 24-hour Reception, room service on days of spiritual surgeries, 24-hour airport pick-ups (not included in the room rate and service provided from a third party), carrying out special food requests, multilingual staff with international hotel experience, unlimited free wifi, laundry service, guest services (bookings and confirmations of flights, city tours of Brasilia and the local area etc), meeting rooms, ATM, night guard ...just to name a few. Rates: R$145 reais per person per night including three daily meals. Pousada Europa, Owned and operated by Marcela Araujo a casa volunteer this pousada with 9 rooms is just four blocks from the casa. Rates are 100 R$ per night (single room) and 200 R$ per night (double room) with 3 meals included. We speak Spanish and Portuguese. Customized service for your needs. Special meals or any other requirements you may have. Wi-fi also included. Dirigida por Izaira e seu sobrinho Junior, ambos voluntários da Casa de D. Inácio. 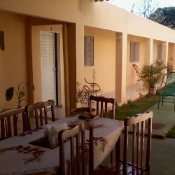 Pequena Pousada a so 6 quadras da Casa com 8 quartos, valor da diária R$ 75,00 por pessoa com 3 refeições incluidas, Wi-Fi. Aqui você encontrará o carinho e a orientação necessárias para a realização do seu tratamento físico e espiritual. This is a small 8 room pousada at a mere 6 blocks from the Casa. It is directed by Izaira en her nephew Junior, both volunteers at the Casa de Dom Inacio. Rates are R$75 per person per day with 3 meals included and Wi-Fi . Here you will find the care and guidance needed for the realization of your physical and spiritual treatment. Corazao Sagradao is a 7-8 minute walk to Casa Dom Inacio & the medium Joao De Deus (John of God) . You'll love it here because of the uplifting & peaceful atmosphere. We offer a choice of 8 rooms & we pride ourselves on the personal service we provide, ensuring every individual need is met & all your expectations are exceeded. The sunny location, access to outdoor areas & proximity to the Casa is the perfect place for everything you seek. 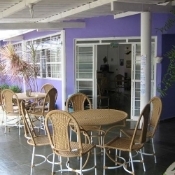 My place is close to the Casa Dom Inacio and all the local cafes, restaurants and convenience stores. Everything you need is within a 10 minute walk. You'll love my place because of the tranquility here. The staff will ensure your stay is memorable and you receive everything you want and more. My place is good for couples, solo adventurers, business travellers, families (with kids), and big groups.